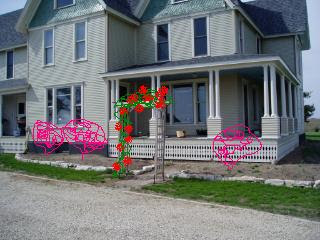 The pink bush shaped scribbles are the flowering almonds. I always heard that when placing things they should be an uneven number because that is more visually pleasing. The only thing I don't know is if that placing applies if you move one across from the other two like this. Plus if you click on the link you notice you get a deal on three. I'm a sucker for deals like this. All you have to do is mark something up and tell me you get a deal buying multiples and I'm piling the shopping cart full. Notice too that Tim got the trellis I got for Christmas from my mom two years ago up this weekend. Actually he had it up three weekends ago, but the puny brackets they sent to put it in the ground with bent the first night. He bought some angled metal pieces and welded some re bar to it to help drive them into the ground and so far this had held up nicely. The only problem is the trellis was used as a ladder at some point breaking the corner brackets. I think that if they are replaced the whole thing will stand up to the wind much better. Also notice the pretty trumpet vine I drew in. They had them on this years Trees Forever order for like $2 a plant (I saw them for $7 at the Wal-mart) and so of course we got them. I placed on at each leg on the left hand side of the trellis. One is starting to leaf and the other one looks like it's a no-grow. I think that will be fine because they're pretty invasive plants from what I heard so I figure this one will be more than able to cover the trellis to the top. And what about the right side you ask? A clematis. I just don't have one chosen yet. They're beautiful. Just keep them trimmed back or you will have a tree out of it. Hi, I just wanted to let you know I was googling blogs for farm houses and I feel like I hit the jackpot here. What an immense amount of work you all have done! It's just beautiful and I love, love, love, love, love the barn!